New Filled Cupcake-flavored Oreos are now in stores for a limited time. 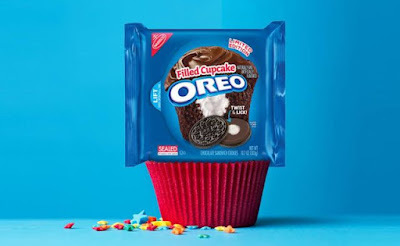 The new limited-edition variety features a chocolaty creme filling with circle of vanilla creme filling at its center sandwiched by two chocolate Oreo cookie wafers. You can find them in 10.7-oz packages where most Oreo products are sold, while supplies last. Expect them to cost about $2.99 a package (may vary). The new flavor follows the recent launch of new Cinnamon Bun Oreos and the return of Red Velvet Oreos. I can't help but wonder if they could have partnered with Hostess to add that trademark icing squiggle.